Many of the poems are devotional in content or style. Several have a biblical basis. I Am that I Am draws on the experience of Moses before the burning bush; Tablets of Stone, refers to his experience on Mount Sinai; Ascension was written on Ascension Day on the slopes of a Swiss mountain. Some, like The Sacredness of Silence come from meditation in a chapel; others, like In the Garden, from experiencing the beauty of creation. 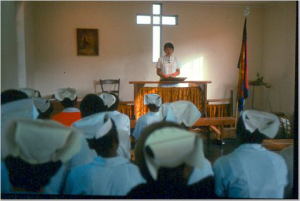 Many follow the Salvationist tradition of expressing spiritual experience in ‘the testimony’. Saved in Time is an example. The themes of life and death appear frequently. Expressionless Death however contrasts with a strong conviction about a commitment to life and living as shown in For Life.